William Daniell RA (1769–1837) was an English landscape and marine painter, and engraver. He travelled extensively in the Far East, helping to produce one of the finest illustrated volumes of the period – Oriental Scenery. He also travelled around the coastline of Britain to paint watercolours for the equally ambitious book A Voyage Round Great Britain. 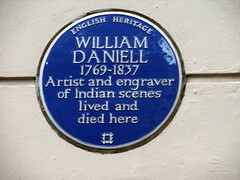 His work was exhibited at the Royal Academy and the British Institution and he became a Royal Academician in 1822.